(Sorry for the Long-ish title. I'll shorten it if you want. Also, if the pictures aren't allowed, I'll get rid of them. I just copy and pasted this from the other site where it was allowed but I didn't see anything against it here. If there is, sorry I didn't see it.) In this story things are getting tossed around a bit. So far I've only completed the Sonic Half but I'll pick back up on the NiGHTS half soon. This isn't the best thing I've ever written but I really just wrote this one for fun. Also there's some debate on NiGHTS' gender so for the simplicity of it all, I just call it a girl. The dark night sky makes for perfect cover. A feminine creature with bat wings glides silently through the security systems. Sneaking into an elevator, she notices a camera. Jumping up, she kicks the camera hard enough to break it into pieces. The guards seem to be sleeping at their posts. The infiltrator quietly makes her way to the containment room. On a pedestal in the center of the room there is a shining, red gem. "This has really become way too easy", says the young woman. She lifts the glass case and switches the gem with an apple. Once she turns around, her eyes catch a glimps of a quick blur. "Alright, who's there? Show yourself!" She says, placing the gem in her bag. A black hedgehog appears before the bat girl's very eyes as if from thin air. "Long time no see, Rouge", he says. The infiltrator, Rouge, backs up a step and leans back on the containment case. "Shadow, yeah it's been about three or fourth months now, huh?" Rouge subtly reaches into her bag to check and see if the gem is still there. She feels something in the bag and removes her hand so she doesn't raise any suspicions. Shadow holds the same red gem in his hand. Rouge clumsily opens the bag and pulls out the apple. "Getting sloppy, Rouge." "Ah, you can't blame me. I haven't actually stolen anything in a while. We've all been too busy, what with Doc Eggman's last scheme taking forever to resolve. I'm just glad that Sonic got to the Emeralds before Eggman did. Besides, how hard can it be for a man with an IQ of above 300 to steal a chaos emerald from this place?" "That's not the point, Rouge. You can't go around stealing Chaos Emeralds like that. It draws attention." Rouge looks around and saw an air vent above her. "Fine, Shadow, keep the Emerald. There are plenty of other gems out their for me. See you around." Rough says, jumping up and prying open the vent cover. Then she flew in and disappeared into the night. Shadow put the Emerald back on the pedestal and walked away, not noticing the flashing red light on a threat monitor in the room. 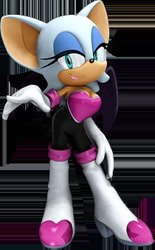 Rouge manages to get some distance between herself and Shadow before circling back around and going to the Emerald room again. Before she takes the Emerald, she notices the threat monitor. She hacks into the computer and sees the statistics. The threat, whatever it was, seemed to be slowly growing. The increased area of it didn't stop in any particular area. It wrapped around the entire planet. "Rouge, I thought I just told you to get out", Shadow says, apparently having never left. "Sorry, Shadow, couldn't resist. Come here, check this out." Shadow crosses his arms and looks at the screen. The activity seemed to be coming from the inner city. "That's not good. Wait, there was a minor quake in that area a few nights ago. Maybe that has something to do with it." "Shadow, what minor quake wraps around the entire planet?" "Well what did you have in mind?" Shadow meditates for a moment then walks up to the pedestal and grabs the Emerald. He walks back to Rouge and takes hold of her arm. "Hold still. Chaos Control!" The two disappear from the G.U.N base in a bright flash. The next thing they know, they're in the middle of the city on a rooftop. "This is where all the activity on the monitor came from." "That's funny. I don't see anything wrong other than some small bits of debris from the quake." Shadow seems to be focusing on a manhole in the street. The lid is removed and he can hear a faint noise. He decides to have a look for himself. Running down to the hole, he hears the tune of a flute playing. But there isn't anyone in the area. When he looks down the manhole he sees nothing. Rouge glides down and looks around herself. The two of them run off and look around the city for any leads when they decide that they can't find anything out from the manhole. But just below the depths of sewer water is a swirling portal forming. A small creature, resembling a faerie, floats through and looks around with a clueless look on its face. Then an arm reaches through and pulls out the body of strange girl in colorful clothing. "W-what happened? Where am I?" She says weakly. The girl breathes heavily at first then collapses there. The small creature cuddles up close to the sleeping girl and hides from the dark waters. User Title : The Cat-Girl! In the valley just outside of the jungle, all is peaceful. A young boy is tinkering in his workshop with a strange device. Outside there is a young man staring off over the sea at the rising sun. Everyone seems to be in a peaceful mood this morning. The young tinkerer rushes out of the workshop, holding the device under his arm. "Knuckles, Knuckles check this out!" He calls out to his friend. Tails opens the device and begins to fiddle with it. A frequency is emitted that can barely be heard. "After Sonic beat Eggman last time, I found this device in the wreckage of his Egg-Tower. It seems to be used to locate Chaos Emeralds." "What's so special about that? You've made an Emerald Tracker before." "Yeah but this one's different. It runs on this special energy that could be from another dimension. And it also has a function for locating sources of it. Look at this! There're sources of it sprouting up all over the place now! But rewind a bit and you'll find that this energy used to be next to nonexistant in this dimension." "Tails, cut to the chase. My head is starting to hurt", Kunckles complains. Suddenly, as if from nowhere, a mechanical arm snatches the device from tails. The arm led to a a small hovering machine with a round man inside. He laughs at Tails and puts the device away. "Thank you, Tails for locating my Emerald tracer. It will prove most useful for my latest plan." "Eggman, you give that back right now or I'll cave that big nose of yours right in", Knuckles threatens. Eggman pressed a button on his hoverchair and a large ship emerged from behind the clouds. It beams him up and flies away at mach speeds. Knuckles and Tails both look at one another and nod. They hopped into Tails's biplane and flew after Eggman's new Egg-Carrier. The Carrier-Cannon shot the two of them clean out of the sky. Knuckles jumped off and made a rech for the carrier but he came up short. Tails grabbed Knuckles and the both of them flew down. The carrier had led them all the way out to the city. They landed in front of Town Hall and looked around. "Eggman never quits", Knuckles ranted. Tails kicked a pebble and looked up. He noticed Rouge and Shadow walking on the other side of the street. "Hey, isn't that...Hey, Rouge, Shadow over here!" Rouge and Shadow turned around and ran across the street to meet the pair. Tails explained to them what had happened and Rouge explained her and Shadow's story. Eggman had a plan and the world was at the mercy of an as of yet unknown danger. But Rouge stood by her theory. "Dr. Eggman has to be behind this. Who else could it be?" She asks, crossing her arms. "She has a point", Knuckles reluctantly agrees. "For now we need to worry about getting to Eggman and getting that device back. It's the only immediate route to any answers", Shadow suggests. The rest agreed, having no idea that they were being watched. The group ran off but was pursued by a young girl similar to Tails. She had two tails like him, at least. "Hm...I wonder what they're up to. This looks like the perfect scoop for private investigator, Addi!" She said. Addi followed the group through the city when the entire group stopped. They were at the manhole where Shadow and Rouge had heard the flute sound. They could still hear it. "What is that sound?" Knuckles questioned. "I don't know but we heard it last night too." Rouge said, flying down the hole. She looks around in the dark, barely able to see. She was about to go up when she discovered something. There was a body at her feet. It was a girl. She wasn't dead but she was weak. "You find anything down there, Rouge?" Tails yells. Rouge, shocked at her discovery, stepped back to find that there was no more water in the sewer. There was only a large hole in the base. "Guys, you aren't going to believe this!" She says. A few minutes later, everyone helps Rouge fish the girl out of the sewer. The little creature was still with her. It was frightened. Knuckles eyeballed it and scratched his head. "Is that some new kind of Chao?" He asked. "I'm not sure what it is", Rouge began. "But it is kind of cute." The girl slowly awakens on the ground, surrounded by the group. She looks around and sees the small creature. At first she grows upset and snatches it from Rouge's hands, thinking she was trying to hurt it. But the creature shakes its head. "Who are all of you?" She asks. "We could ask you the very same question", Shadow says coldly. "My name is NiGHTS. Where am I? What's going on." "We were hoping you could tell us." Knuckles says, shaking his head. Far up in the sky, on Eggman's Egg-Carrier, the menacing genius tinkers with the Emerald Tracker and seems quite please with its modifications. "Soon Sonic, very soon." He says, laughing maniacally. In recent events, Shadow the Hedgehog and Rouge the Bat have discovered a strange energy force that threatens the very existance of the planet. Later, Knuckles and Tails came across a startling discovery. This strange energy force seemed to be from a completely different dimension. Now, in the midst of the crisis, a strange girl has appeared before them. But where is she from and what trouble does she bring with her? With past events in mind, the group meets at Tails's workshop near the jungle. They allow the girl to fully rest before confronting her. Tails has been working on a new bi-plane when she awakens. She finds herself in a small room with Shadow standing in the corner of the room. "Interrogation time. Let's start with where you're from, shall we?" The girl looked around. Her little frind was nowhere in sight. Shadow stood there with his arms crossed and glared at her coldly. She got off of the bed and started to float there. Then she flies outside to find Rouge holding it and looked out at sea. "Oh, hello. You're quite the heavy sleeper. You were out all day and night. So what's your name again? "My name is NiGHTS. Where is this? Is it a new part of Nightopia?" "Nightopia, I've never heard of that place before. Is it where you're from?" Rouge asked with a welcoming smile. Tail and Knuckles walk outside of the workshop and discover the girls conversing. NiGHTS still doesn't seem to fully trust her but for the time she has no choice. The two of them talk about everything that'd been happening. Later that night the entire group discussed it. NiGHTS had come from a completely different world called Nightopia. She told the gang of her countless adventures and her encounters with the all powerful entity known as The Wizeman. Then she explained that she'd recently been thrown into the abyss known as the black sea. Supposedly, if you were thrown into the black sea, you could never return to Nightopia. Just as the group is wrapping up the conversation, a brigt light appears before them. From the light emerge two familiar faces. One is a young, silver hedgehog resemblent of Shadow and the other is a young cat. "Shadow, we're in trouble." The young man says frantically. Silver takes a deep breath then looks at NiGHTS. "T-that girl...I recognize her. She's the one who started this whole catastrophe! It's the future. It's practically in ruins. It all starts not long from now and it's because of this girl!" NiGHTS backs up in fright. "W-what did I do?" She asks. Knuckles and Shadow hold NiGHTS against the wall and tell her not to move. "What are you up to, huh?" Tails questioned. "Easy, Tails, just stay calm. There's definately an explanation. But we won't find anything out by jumping to conclusions. That goes for you too, Silver", says the cat girl. Rouge nods and crosses her arms. "Blaze is right. Haven't we all learned by now that jumping to conclusions just gets everyone into even more trouble? Besides, Tails and Knuckles have proof that Eggman's been up to something lately and it seems to involve some form of energy from her dimension. Maybe her being here was a side affect of Eggman's energy theft." "That actually sounds like a logical explanation to her being here", Tails agreed. "But I know for a fact that I saw someone that looked exactly like her in the recording of what happened just before the world went to heck!" Silver said angrily, pointing to NiGHTS. "There is one other that looks somewhat like me. His name is Reala. He was one of Wizeman's greatest followers. When I beat Wizeman, he must have turned traitor and taken control of the remaining Nightmaren army. That's how he was able to ambush me", NiGHTS suggested. Shadow looked to Silver and let go of NiGHTS. Knuckles backed up as well then stepped to the side. "Rouge, you found NiGHTS and that small Nightopian creature down in the sewer but there wasn't any water. D'you think there's a chance that the hole you saw down there was a portal?" Shadow asked. "That'd make more sense than most of what I've been hearing all day. Let's get back to town and check it out." Once the group arrived in town, they were greeted by a slew of bizzare creatures. They were chasing people around and causing utter mayhem. In the middle of it all was a floating man who did indeed look plenty like NiGHTS. It was Reala. He floated above the scene proudly then noticed NiGHTS. "What, that's not possible. I got rid of you", he snarled. "Nothing can get rid of me, Reala. Least of all, you." "NiGHTS, NiGHTS, NiGHTS you don't understand at all. Your being here doesn't cripple my plans in the least bit. If anything, it simply boosts my chances of success. You were only any good when you were the only one who could dualize. But now I can do the very same and rid myself of you once and for all. Unfortunately I'm to busy at the moment to bother with you. I've got a power source to find. And I happen to know how I can find it." Reala bows then turns and flies off at high speed. NiGHTS rockets off after him. Tails and Knuckles look at each other and nod. "Rouge and Silver, you two take Shadow and Blaze up. We'll be right behind ya", Knuckles says. He and Tails get on the train and head back to the workshop. Rouge grabs Shadow's hand then flies up after the Nightopian duo. Silver holds onto Blaze as he telekinetically lifts the manhole cover they're standing on and uses it to follow the rest. The chase becomes an all out battle when NiGHTS and Reala clash in mid air. Reala throws NiGHTS from him then slams into her. He then proceeds to ascend. When high above the clouds, everyone sees where Reala is headed. It's the Egg-Carrier. Within the massive ship, Eggman's well aware of the coming party but he sees the hard time they're having and decideds to tend to his own problems for the moment. A young girl is running around the Egg-Carrier, smashing everything she sees with an enormous hammer. "Eggman, I'm not playing these games any longer. Where. Is. My. SONIC?!" She yells, holding up the hammer. Over the intercom of the ship, Eggman demands that the girl stop at once. "You little brat! I have no idea where your little boyfriend is! Now get off of my ship!" "No way! My Sonic senses have been tingling all day. When I got here, the senses got so powerful I almost got a head ache! Now where is he?! You can't keep him locked up forever you know! There's no way this Amy's giving up!" In recent events, the group has discovered from the future duo, Silver and Blaze, that world is headed for the worst. Everyone but Rouge and Blaze immediately jump to the conclusion that NiGHTS is behind it before Rouge and Blaze rationalize. They soon opt to see for themselves what's in store by going to the city and seeing the place where NiGHTS originally entered their world. They were welcomed by a nightmare brought to life. At the head of the bizzare attack was none other than NiGHTS' sworn enemy, Reala. He proceeded to take off in search of something which led most members of the group to The Egg-Carrier. Now it's an all out air battle. Wait, how did Amy get aboard the ship? NiGHTS rams herself into Reala high up in the air in an attempt to disorient him. Reala tehn spins around and kicks NiGHTS. The two of them soon flew head on at one another. They both bounced back a considerable amount from the impact. Reala shook it off and tried to make a break for the ship but NiGHTS wouldn't have it. She grabbed him by the leg and circled around, throwing him in the opposite direction. "You're not getting the Ideya, Reala. Just give up while you have a chance", NiGHTS demanded. Reala flew straight down then back up behind NiGHTS and hit her in the back. He flew for the Egg-Carrier after that. Rouge managed to get ahead of him. She dropped Shadow like a projectile and he crashed directly into Reala. Reala spun around, making Shadow fall. Then he flew to the Egg-Carrier with Blaze attempting to slow him down by throwing fire at him. But he got away. Everyone flew to the Egg-Carrier and looked around the deck in search of any means of locating him. "Where do you think that guy went?" Silver asked, jumping onto the ship. "If we split up we can cover more ground", Rouge suggested. Shadow turned and started to walk off alone. "I owe the Doctor a visit", he explained. Then he ran off. Silver left with Blaze and NiGHTS flew off on her own, leaving Rouge alone. Eggman soon realized that his ship had been boarded. He hesitated to take his full attention away from Amy for even a second. "Hey, Eggman, I know you hear me talking to you!" "Just a minute, Amy. I'm quite busy at the moment. My security systems won't arm themselves you know." "What's that about security systems?" Amy realized that something was wrong. She sees the monitor up in the room and sees her friends wandering through the corridors of the Egg-Carrier. "Oh no, I have to go help them! I'll be back for you later, Eggman!" Amy declares, holding her hammer over her shoulder and runing off. Eggman waits until she's away from the screen then lets out a sigh of relief and wipes the sweat from his brow. Silver and Blaze walk through the incarceration room then stop for a second. They're suddenly ambushed by a hoard of Eggman's Robots. Silver knocked them all down telekinetically then ran past them. Blaze jumped over them all and followed. Not long after, the two of them ran into Amy who'd come from another room. Silver picked himself up then helped up the girls. "Amy, what are you doing here?" "I could ask you the same question. I'm looking for Sonic. I have this feeling he's around here somewhere." "We're here looking for this bizarre looking guy. He came here to steal something from Eggman. You know it's bad when you steal from a bad guy", Blaze explained. Amy looks over her shoulder and crushes a robot beneath her hammer. "Well what are we waiting for? Let's get moving!" The trio proceeded to look for Reala within this massive ship. Eventually they wind up on the main bridge to find that a black and red robot is eradicating the rest of the Eggman robots. It gunned them all down and blew them to smithereens. When it noticed something behind it, it turned around and aimed at the trio but it quickly recognized them as allies. "Scan complete. Data Analysis Confirms Amy, Silver, and Blaze. Allies." "Hi there, Omega! What are you doing up here?" Amy said cheerfuly. "Eggman was near. I could not leave the opportunity for revenge. The odds of another chance any time soon were between slim and none." "Can you help us out here? I promise you can go after Eggman when we're through. It's a very important mission." Within the main control room, Eggman is busy scrambling multiple security forces. Suddenly he's stopped in his tracks when the clawed hand of Reala grabs his arm and holds it away from the controls. "My good man, would you happen to know where I might find somthing?" "Wrong answer", Reala said with a smirk. Reala then picks Eggman up and tosses him aside. He proceeds to search the cabin until he finds what he's looking for. There is a shining. white gem inside of a machine in the room. Reala opens the hatch and proceeds to steal the gem. "No, you have no idea what you're doing! Without that Chaos Emerald, this ship will turn into one enormous bomb!" Eggman yelled. Reala turned to leave but he found that Shadow stood in the doorway. "I came here to speak with the doctor but now I'll get to hit two birds with one stone. Where do you think you're going with that Chaos Emerald?" "Oh come now, you really believe that you can stop me?" Reala sneered, holding up the Emerald. "What were the words again? Oh yes, I believe it was Chaos Control." Reala smirked at Shadow then vanished in a flash of light. Shadow tried to get to him but he couldn't get there before Reala disappeared. He left Eggman on teh ground and ran off to warn the others. A massive army of Eggman Robots approached Silver, Blaze, Amy, and Omega. "Probability of survival is small." "Do me a favor, Omega", Silver began. "Keep stuff like that to yourself." Silver tried to pushed them all but her couldn't. There were too many. He settled for picked one up and tossing it back like a bowling ball. Amy charged into the hoard with her hammer and crushed anything that got within an inch of her. Blaze and Omega leveled out as much as they could but there were just too many. Suddenly Rouge and NiGHTS appear. They begin to pick robots up and toss them over the side of the ship. Shadow makes it outside and runs circles around the robots, creating a large twister that tosses the a few over the edge of the ship but there are still too many. It seems like the group is about to get gunned down when Tails and Knuckles fly by on the new bi-plane. It's armed with a few new attachments like guns which level out a good amount of robots. Then it drops a few mines and destroys another good portion. 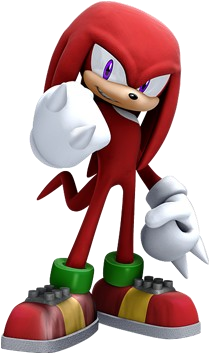 Knuckles jumps down onto the ship and punches the ground, creating a shockwave that throws the rest over. "That takes care of that." He says, clapping the dust from his hands. "Whoa, hubba hubba, big guy. That's some serious muscle you got there", Rouge compliments. Knuckles blushed and rubbed the back of his head. "For an air head." "What'd you just call me?!" "Now isn't the time for this", Shadow says. "Reala got away." NiGHTS grew annoyed and bit her thumb. "Did he get the ideya?" She asks. Shadow shakes his head and looks up at her. "Worse, he got away with a Chaos Emerald." "What would he want with a Chaos Emerald? What good would it be to him?" Rouge asks. Tails lands the bi-plane and hops off holding Addi's wrist. "I had a stow away on board." "Eheheheh, hiya folks." Addi said nervously. Everyone simply stares at her for a moment then at Tails. The Egg-Carrier suddenly shook and began to fall. "Whoa, what's up with the earthquake in the sky?" Tails throws Addie back in the plane and starts it up. Rouge grabs Shadow and flies off. Omega holds Amy then hovers down. Silver and Blaze both jump over the edge and float down using Silver's telekinetic powers. NiGHTS flies off and Knuckles grabs hold of the plane as Tails flies off. The Egg-Carrier crashes into a nearby mountain as everyone seems to have gotten away. But the feeling doesn't last. Everyone seems to have gotten sperated by the force of the blast. Tails, Knuckles, and Addi are the only ones to make it to the workshop. Everyone else winds up in the jungle somewhere. Back at the workshop, Knuckles and Tails sit Addi down for a chat. They question her about why she stowed away on the bi-plane. She explained to them all about how she decided to tail them for the biggst scoon of her career. She also explained how she had kind of spilled all she'd learned to Reala when he threatened her. She'd told him about the Emeralds and Chaos Control. Knuckles walked outside and left Tails to deal with her. Addi asked if she might join the group and Tails reluctantly opted to let her join them. Tails, Addi, and Knuckles all hopped back into the bi-plane shortly after. "Where are we going?" Addi ask. "We're goin' to the jungle. The blast seperated us and that's more than likely where they landed." Knuckles explained, crossing his arms. "Just don't touch anything. We'll be there quick." After that, they took off to find the rest of their friends in the jungle before something bad happened. The last we saw our heroes all together, they were battling the interdimensional cretin, Reala. Reala managed to evade them and reach his destination, The Egg-Carrier. Pursuing Reala, the group boarded the massive ship and split up. But they weren't fast enough to prevent Reala from stealing the Chaos Emerald from the Egg-Carrier's main control room. After fending off Eggman's security forces, the team evacuated themselves from the ship but were split up in the blast. Now they'll have to find their way to the others if they ever hope to save the world. Somewhere deep within the jungle Amy awakens to find Blaze on the ground unconcious. She looks around to find that they're completely alone. The sky is dark and clouds violently spin. Amy immediately tries to wake up Blaze. When Blaze awakens, Amy points up at the sky. "Do you think that Reala could have done that?" She asks. Blaze thinks for a moment then recalls their most recent encounter with Reala. "When we ran into Reala in the city, he summoned an army of nightmare creatures from his dimension. They swarmed the entire city. But even with the Chaos Emerald he doesn't have enough power to expand his reach so drastically. He'd need them all. No, this has to be something else. Let's go check it out." "But what about everyone else? We should really try to find them before we try and take on Reala." "Good idea." Blaze says, running off into the jungle. Amy follows with her hammer over her shoulder. After a few minutes, Amy and Blaze run by the old ruins. Amy runs back and looks at them. Blaze stops when she realizes that Amy is no longer behind her. She runs back to find that Amy is walking up the stairs of the ruin. She stops at the entrance then turns to Blaze. "Come on Blaze! I have a feeling about this ruin!" Blaze walks to the top of the ruins with Amy and looks back down. "What's so special about these ruins, anyway?" "Well I think they're magic", Amy explains. Within the next ten seconds, Amy grabs Blaze by the wrist and pulls her into ruins. The two of them then see a flash of green light at their feet and suddenly it's gone. Outside it is bright and sunny. It's not just a jungle there anymore. It's an ancient civilization. People similar to Knuckles are all around. The area is strangely familiar to Amy. Then it hits her. "I know this place. We're in the past! And if I'm right, that path there leads to...come on Blaze!" Amy runs off through a cave and comes out on a mountain side. Blaze walks out of the cave then freezes in astonishment. "That's the floating island where the Master Emerald is! Let's go!" The two of them reach to bridge to the island but are shocked to see what awaits them on the other side. Omega somehow wound up there as well and he fighting many of the ancient warriors. "Wait, what's Omega doing? Why is he shooting at them?" Blaze asks, stepping forward. Omega turns his sights to the girls then aims at them and fires. They jump out of the way but Amy nearly falls off of the bridge. She catches the edge and Blaze helps her back up. "I think Omega is malfunctioning. He's going to shoot at everything he sees." "Then how do we stop him from destroying everything?" "Tails made an artificial Chaos Emerald once. After Omega game up his initial Chaos Emerald, Tails game the fake one to him as a new power source. If we take it out and put it back we may be able to reset him. You distract him and I'll get behind him." Blaze nods in agreement then jumps at Omega, dodging any fire coming her way. She jumped off of his head then high up in the air and rained fire down on him but Omega's fireproof body resisted it. Amy ran up in front of Omega then hit the ground with her hammer, springing herself high up in the air. She came down behind Omega and hit him in the back with the hammer, ejecting the Pseudo-Emerald. Blaze picked it up and looked at Amy. "Nice work, Amy." She slipped it back in and Omega turned back on. "Analyzing. Data Analysis confirms Amy and Blaze. Allies." "Nice to see you too, Omega", Amy says smiling. The three of them walk to the Master Emerald shrine and see a young girl there playing with the Chao around her. She turns and sees everyone standing there and cluelessly blinks. "Is there anything I can help you with?" She asks. Amy and Blaze walk to the top of the shrine. "Well I'd like it if we could maybe see the Master Emerald", Amy suggested. The girl stood up and stepped aside. Omega walks past her then looks back. "Analyzing. No Data. Location Unknown." The Master emerald begins to respond to the Pseudo Emerald within Omega and projects an image of this girl. She is with a strange creature strangely made of some form of liquid. "Hello, Amy. Who are your friends?" "Hi, Tikal, these are Omega and Blaze. We could use your help if you don't mind. We wound up back in this time period. We need to get back to our own ASAP. Something really bad could happen if we don't. Tikal's image soon disappeared and the Master Emerald began to glow. Amy turned around and waved to the real Tikal then she and the others disappeared in a shining green light similar to the one from the ruins. She soon reappeared at the shrine but in their own grim time. "What? What happened? Are we back?" Blaze questioned. "Yeah. Blaze, Omega, I have an idea. You two make a flare or a beacon of some sort! that'll get the others to know we're here and they'll come to us rather than us having to search for them." Blaze nodded and shot a fireball into the sky. Omega aimed at it and shot a flamethrower at it, creating a massive beacon that lit up the gloomy skies. Somewhere deep in the jungle, someone sees the beacon and runs off in its direction, leaving a blue streak behind them. Shortly after, a similar black streak jets by. Amy and Blaze have awaken to a rather grim looking surrounding. They venture through the jungle in search of their friends, only to wind up in the past where they run into a malfunctioning Omega. After resolving that issue, Amy confronts the Tikal that sealed herself and Chaos within the Master Emerald. The trio find their way back to their own time and send a beacon which they hope will attract their friends. It may just work. Rouge awakens alone deep within the jungle. She soon sees a black streak speed by. Recognizing it as Shadow, she runs after him. Soon she realizes that he's running in the direction of a large beacon, shining in the sky. Rouge jumps up and flies toward it, believing it to be her friends. From the skies, she sees that it's coming from the floating island. She can vaguely see Omega shooting a large stream of fire into the sky. Rouge flies towards it, noticing that NiGHTS seemed to have the same idea. They see eachother in the sky and proceed to the island. Amy welcomes the two of them as they come in. Shadow soon makes his way there and jumps over the gap where the bridge once was. "Well, we're here. Now we just have to wait for Silver, Tails, and Knuckles." Blaze explained. Shadow leaned on the shrine and melted away into deep thought. He stared off into space then realized that Rouge was standing in front of him. "What's the matter, Shadow? You're awfully quiet, even for you." She questioned. Shadow looked down. "I think I saw Sonic back there in the jungle." "What? Well what was he doing all the way out here?" Rouge asked. "I knew my Sonic was on Eggman's ship! When I get a hold of Eggman I'll..."
"Amy, calm down", Blaze warned. Silver soon appeared at the other end of the gap between the island and the mountain. "Hey guys, come here! I think I found a couple of Chaos Emeralds!" He yelled. Shadow jumped the gap and followed Silver inside the cave. Everyone else quickly went after them. Shadow came out holding a glowing blue gem. But it's not a Chaos Emerald. It's spherical. NiGHTS rushes Shadow and takes it. "T-this is an Ideya. But how did it get here?" "What is an Ideya?" Amy asks. NiGHTS lands in the middle of the group. She holds the Ideya up and a bright blue light shines into the sky. "This is an Ideya, alright. Ideya are like...They're like the Chaos Emeralds of my world. There are only 5. There's White for Purity, Blue, like this one, for Intelligence, Green for Growth, Yellow for Hope, and Red for...Courage." "Well then why would Reala go after a Chaos Emerald and not an Ideya? Wouldn't the Ideya be more beneficial to him since he's from your world?" Blaze asks. "I think I've got an idea of why he's after Chaos Emeralds. But we should try to be sure. Let's go find Reala when Tails and Knuckles get here." A mechanical arm reaches out and snatches the Ideya from NiGHTS' hands. "What? Hey, give that back!" "Thank you for the Chaos Emerald. I'll just be on my way now", Eggman declares. Before he leaves, he takes the Ideya into his own hands and notices the difference. "Wait. This isn't a Chaos Emerald. It's of no use to me. You can have it", he says. He throws it back and begins to leave before Omega extends his arm to keep him in one place. Shadow vanishes in a flash of light then reappears on Eggman's hover chair. "Hello Doctor, I believe I owe you. I didn't get to speak with you last time we saw eachother", he says. Shadow tosses his Chaos Emerald to Omega for storage then lifts the Doctor up from his seat. Eggman smirks and presses a button on his sleeve then both he and his hover chair vanish. "What?!" "How'd he do that?" Amy asked. "He may have another Chaos Emerald", Blaze suggested. Shadow shook his head. "No, I would have sensed it. It was just another of Eggman's dirty tricks." He said, jumping back to the others. A loud noise suddenly echoed from overhead. Everyone looked up to see Tails, Knuckles, and Addi coming in on the bi-plane. They landed on the floating island and got out. Everyone got together and heard Addi's tale. Not long after that, Knuckles had to keep everyone from throwing her over the edge. "Listen, everyone, we've got bigger worries than her. Right now we should be worrying about handling Reala. Tails thinks we should try and find the rest of the Chaos Emeralds before Reala does. We have one and Reala has one. That only leaves five", Knuckles announces. Everyone debates over the best plan of action. It was difficult considering they never really had a plan for anything before. Eventually they came to a decision. NiGHTS and Shadow stood at the top of the Master Emerald Shrine. "Alright here's the plan, everyone." NiGHTS declared. "We'll split into three teams. Rouge, Knuckles, and Omega will go search for the Chaos Emeralds. Silver, Blaze, and Shadow are going to go do what they can to stall Reala. Amy and Tails are with me. We're going to go look for the remaining Ideya." Everyone teamed off immediately. Tails handed Knuckles an Emerald Tracker and that team split. Shadow, Silver, and Blaze left for the city in hopes of finding Reala there. Amy and Tails jumped into the bi-plane with Addi and flew off with NiGHTS right beside them. "NiGHTS, how will you know where the Ideya are?" Tails asked. "I can sense them. It's built into me." "Well is there one nearby?" Amy asked. "Actually, yes there is. It feels like there's one out at sea. What's out there, anyway?" Amy and Tails looked at one another then it clicked. "The Old Egg-Carrier!" They said simultaneously. NiGHTS flew off in a blur and Tails sped up. The team landed on the Egg-Carrier Mark 1 shortly afterwards. Tails, Amy, and Addi all got out of the plane and followed NiGHTS. NiGHTS flew into a large room that looked like it'd been used to create and modify robots. At the end of the room was green glow. NiGHTS flew up to it but when she tried to reach for it, mechanical arms held her in place. She struggled to get loose but it was no good. Amy ran through the room, dodging mechanical arms and finally freed NiGHTS with her hammer. NiGHTS grabbed the Ideya and the mechanical arms all dropped. "That's strange. It was like the Ideya were powering these old machines", Tails said. "That's no concern to us right now", NiGHTS began. She flew out of the room and stowed the Ideya away in the plane. "Let's go find the other three." Then she flew off. Tails, Amy, and Addi climbed back into the plane and took off. In the city things weren't going very smoothly. Shadow was too occupied by all of the Nightmaren to help Silver and Blaze fight Reala. They were having a hard time hitting him because he refused to stay still and he was too far away for Silver to reach telekinetically. "You don't honestly think you can defeat me do you?" He asked. Blaze threw a fireball at him but he plucked it away like a bug then the ChaosEmerald appeared in his hand. "Fine. I'll show you just how in over your head you are." He said laughing. The Chaos Emerald began to glow and the duo back up as the glow overtook the entire street. The group soon returns to being together only to split up again after the discovery that the Ideya from the Nightopian dimension have somehow wound up in this world. NiGHTS was able to locate the second Ideya but three more remain. Shadow, Silver, and Blaze reach a snare in trying to distract Reala. Reala's powers have been boosted considerably with the Chaos Emerald. Can they ever hope to defeat him? Silver and Blaze fall to the ground unconcious and Reala looks all around him. Shadow stands there alone, realizing that the creatures have all disappeared. Reala begins to fly away, unaware of Shadow's presence. Shadow jumps up onto a building then pursues Reala, jumping from rooftop to rooftop. He watches as Reala comes to a pause then gets out the Emerald. He then holds it in front of him. The Emerald seems to be pulling him. "What's he up to? Is the Emerald actually...It must be guiding him to the other Emeralds. I'm not sure if I can get the Emerald from him. I should warn the others first." Shadow jumps down then runs back to Blaze and Silver. He picks them both up over his shoulders and helps them to a train which they take to the workshop. High up in the sky, NiGHTS is leading her group. She stops for a second then flies straight down. Once she clears the clouds, she discovers that the next Ideya is at the Metal Harbor. She went down to the missile control room and looked aorund but she didn't see anything. Tails and the others had just landed outside when she got out. "I can't find it anywhere. Where could it be?" NiGHTS complained. "We could try searching in the security warehouse. The Ideya was being used to power those machines back in Eggman's ship. Maybe this one's in a robot", Tails suggests. "That's a good idea, Tails. Let's check it out guys", Amy said cheerfully? She hopped out of the plane and looked around. NiGHTS, Tails, and Addi soon followed but soon the search turned to disaster. The group was suddenly attacked by a hoard G.U.N security drones. The army of robots immediately opened fire on everyone. NiGHTS grabbed Amy and flew directly up. Once high enough, NiGHTS dropped Amy and let her drop with her hammer, clearing a path. Tails and Addi ran through. NiGHTS and Amy made a break for the closest building. Once inside, everyone braced themselves up against the door. NiGHTS saw a bright yellow glow across the room. She rocketed across the room as fast as she could. Meanwhile, Knuckles, Rouge, and Omega found a possible Chaos Emerald location. The Emerald was in the Windy Valley. The valley was notorious for having hidden paths made of the wind. Knuckles clung to the sides of the floating platforms then climb his way up. "I hate this place", he complained. "What's wrong, muscle boy, afraid of heigths?" Rouge teases. "Rouge, we must focus on the main objective. Sensors are picking up two Chaos Emeralds in the area. One of them is moving. The other is just ahead", Omega said. Knuckles climbed up and looked down at a long twisting pathway. "You'd have to be as fast as Sonic to run that thing!" He said. "The wind'll help us with that. Meet you at the bottom", Rouge said. She jumped over the edge and flew past the path. Omega hovered down the path and Knuckles hesitantly followed. Rouge landed on an off platform and waited but a violent current tore the path apart, causing debris to fly in every direction. Knuckles jumped on every bit of debris and used it for momentum in jumping to the platform. Omega came to a sudden stop and blasted through the debris then hovered across to the platform. Knuckles pointed out that he could see the Emerald on a platform just ahead. The wind there was blowing in an upward direction so he jumped. The wind pushed him back up and he landed perfectly on the platform. Rouge flew up with Omega not far behind. Just as Knuckles begins to reach for the Emerald, Reala appears and takes it before his very eyes. "Too slow", he taunted. "What? You? Give that back right now!" "Why why would I do that?" Reala was suddenly kicked in the back by a young hedgehog. The hedgehog held a blade in his hand and wore shades on his head. "You'll give it back because it doesn't belong to you", he demanded. Reala got to his feet and held out his hands. The Chaos Emeralds were gone. The hedgehog took a step back but Reala made the Emeralds reappear. The Emeralds let out a great flash and he vanished. He reappeared behind Omega and ripped the Chaos Emerald from his storage unit. Omega tried to turn and hit Reala but he'd already disappeared. Reala reappeared before them all high above them then gave a final bow and vanished in a flash with all three of the Chaos Emeralds. "Dang it, he got away!" Knuckles yelled. "Sorry I couldn't stop him. Thought I could get him to drop him if sneaked up on him. The name's Slash, Slash the Hedgehog." A strange frequency began to emmit itself from Omega. Then a voice was projected. "Omega, come in. This is Shadow. We have a problem. Reala's using the Chaos Emerald he already has to find the others. You can't let him get to the rest. How's the mission going so far?" "Current Success Rate in our Primary Objective is Unsatisfactory. Reala was able to steal the Chaos Emerald from the Windy Valley as well as the one you gave to this unit." "That's not good. That means he has three. I just checked with Tails. They have three Ideya and are En-Route for a Fourth. Apparently there's reason to believe that Eggman may unknowingly have it. I've also found a Chaos Emerald myself. It was in a cave near the workshop. Omega, you have to find the last three Emeralds before Reala. If he comes here, I'll hold him off." "Affirmative, Shadow. Allies, we need to move." "Right", Knuckles began. "The next Emerald's somewhere in The Dry Lagoon." "I know that place like the back of my hand. Let's go", Rouge urged. The group agreed on it and headed back to the Valley to be on their way. Not far away, high up in the skies, the successful location of the third Ideya has led to the round up of the fourth. But NiGHTS can't pinpoint the location. Tails does some thinking then comes up with an idea. Eggman was heading off in the direction of Pumpkin Hill. Tails decided to take the lead with NiGHTS not far behind. Once at Pumpkin Hill, Tails landed the plane and everyone got out. NiGHTS flew around in search of the Ideya when an EggMan robot appeared and attacked it. It shot her out of the air and another robot caught her. "NiGHTS!" Tails yelled. "Come on, we've gotta go help her!" Amy says. She grabbed her hammer and ran off. Tails held onto Amy and flew to the top of one of the hills with Addi flying not far behind. They noticed that the robots had carried NiGHTS off into one of the pumpkin faced mountains. They landed on one and looked around for a trap door. But the trap door found them and they fell the entire way down into the darkness. They awoke in a cell in what seemed to be Eggman's newest base of operations. "Where are we?" Tails asked, holding his head. "It's Eggman's new Egg-Tower. He built it inside of one of the pumpkin mountains. Earlier he walked by here to gloat then two robots pushed NiGHTS by on some table." Amy explains, crossing her arms. "Well how are we going to get out of here?" Addi asks. Amy's hammer was in a room across from them so she couldn't do anything to get them out and Tails didn't have any gadgets on him that would help. They could be stuck there. After a couple of hours, the monitor in the corner of the cell turns on revealing Eggman in an experimentation room with NiGHTS. "So you thought I would give it up that easily? These gems you have are like the Chaos Emeralds of another Dimension. I'm going to use them to beat that freak in the clown suit then I'll use them to finally create my empire! The Chaos Emeralds are too much of a hastle anyway!" "Eggman, you'd better let our friend go!" Amy demands. "Sorry, Amy, I'm afraid I can't do that. Once I convert your little friend, I can use her ability to sense these gems in order to locate the remaining two and then I'll have all I need! Say goodbye to your friend!" The monitor then turns off leaving Amy, Tails, and Addi in the cell to try and figure a way out of this mess. Rouge, Knuckles, and Omega finally reach the Dry Lagoon where Rouge immediately takes charge. Knuckles searches high and low but can't find the Emerald and Omega destroys everything in sight trying to find it. Soon the search turns to disaster. Knuckles and Omega can't find a thing. Then Rouge suggests that Knuckles follow her. Leaving Omega and Slash there to stand guard. Knuckles and Rouge board a massive turtle that takes them to the other end of the lagoon where Knuckles immediately sees the Emerald atop a pillar in the middle of the lagoon. He proceeds to climb it while Rouge stays below as a lookout. Back at the workshop, Shadow walks outside to look over the cliffside at the sea. The sun is beginning to set peacefully. The feeling does not last, however. The sky suddenly turns dark and clouds begin to swirl violently. Shadow hears a sinister chuckle then turns around to see the mad Nightmare in the flesh. "If I were you, I'd hand over that Emerald right now", says the devilish creature. "Who's going to make me?" Shadow says, challenging Reala. Catastrophe seems to have struck all around. Each team has their hands tied at the moment. As Knuckles makes his reach for the Chaos Emerald, an army or Nightmaren creatures fall from the sky. NiGHTS has been captured by Dr. Eggman and is on the brink of being turned into a living weapon. Tails and the others can't save her while behind bars. Shadow is left alone to fend off Reala, who currently posseses three Chaos Emeralds. Shadow has a Chaos Emerald in his possession but it may not be enough. Reala waves his hand and his three Chaos Emeralds appear before him. Shadow's Chaos Emerald floats out of the workshop and into his hand. Reala quickly disappears then reappears in front of Shadow in an attempt to snag the Emerald but Shadow teleports behind the nightmarish fiend using chaos control. Reala then draws power from his Emeralds and fires at Shadow consecutively. Shadow dodges best he can then teleports high above Reala. Just before he lands on Reala, there is a bright flash. When the light clears, Shadow is on the ground and Reala has his Emerald. "Come now, you were outnumbered three to one." "That may be. But I'm not about to give up without a fight." Shadow says, struggling to his feet. Back in the Dry Lagoon, Knuckles and Rouge struggle to fend off an army of Nightmaren creatures. Knuckles unleashes punch after powerful punch as Rouge delivers a flurry of quick kicks. The two fight back to back until they see an opening. Knuckles holds onto the Chaos Emerald as if his life depended on it. Then he and Rouge dove back down into the water and swam to the others. Slash cut up as many Nightmaren as h could but more and more continued to come. "The unit has analyzed the situation. Multple Enemies inbound. Best course of action would be to create an opening and escape" Omega buzzed. "Dually noted", Slash says. He proceeds to cut a clean path through the Nightmaren. Knuckles and Rouge emerge from the waters and see the path being made. The quickly get up and run through as fast as they can. Rouge kicks through any that seem determind to get in the way. The group reaches the cave leading out of the Dry lagoon and the Emerald begins the glow. The next thing they know, they're in the Aquatic Mine. Knuckles walks ahead of everyone and looks around then nods. "I have some good news, some great news, and some pretty awful news for you. The good news is that there's a Chaos Emerald in this general area. The great news is that I've been here before so it shouldn't be difficult to find. The terrible news is that to get back to the workshop from here would recquire a pass through the Wild Canyon and Pumpkin hill if we want to take the fastest route." Knuckles expalins, checking the Emerald Monitor. 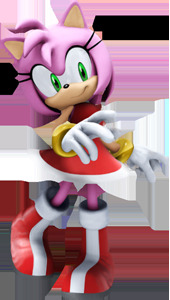 Rouge shrugs and walks off to search for the Emerald. I the Pumpkin Hill Egg-Tower, Amy and company are busy trying to figure a way out of the jam they were in. There didn't seem to be any way out. Eggman appears on the screen in the corner once more, declaring that he's ready to begin the experiment. NiGHTS is loaded into a massive machine before the group's very eyes. Eggman then presses a button and the machine puts NiGHTS through a painful looking electrical field. NiGHTS tried to fly from the table but the restraints are too powerful for her to break free. The process was beginning to look too brutal to watch. Amy ultimately turns her head in shame. Tails and Addi both watch in terror as NiGHTS lets out a blood curdling cry. Suddenly the machines stops and NiGHTS is freed. She drops to the floor unconcious as Eggman searches for the cause of the power shortage. When he turns around he sees a familiar face holding the power cord. "Sorry, Eggman, you'll get your little toy back when you're learn to play nicely." Amy immediately recognizes the voice and looks back up at the monitor. The famous, blue hedgehog stands there proudly next to the machines. Then he picks NiGHTS up and runs out of the room at blinding speeds. He runs past the cell and it unlocks before the group's eyes. Sonic sees the upward tunnel then jumps from wall to wall until he reaches the top. Addi and Tails grab Amy and fly directly up after them. Once they escape the tower, they realize that the Ideya is still with Eggman somewhere. "Oh no, we have to go back! The Ideya is still with Eggman", NiGHTS paniced. Meanwhile, Shadow was getting hammered. But he continued to get back to his feet no matter how hard he was hit. In the end Shadow came up with a plan. He ran circles around Reala, creating a twister that threw the Emeralds into the air. Shadow jumped up then began to turn red. His body let off a red glow and soon that light became a concentrated sphere. "I will not let you destroy everything that matters." Shadow said, removing the rings from aorund his wrists. "Chaos BLAST!" Shadow exploded with a burst of Chaos Energy. Reala was thrown back and disappeared. Each of the four Emeralds he once had were scattered once again. When the blast cleared, Shadow was on the ground out cold. Sonic and company wound up on the Emerald Coast as a result of Chaos Control. The Nightmaren seemed to have disappeared for the time being. Sonic put NiGHTS down and the group all sat to talk about what had been going on in the past few days. Sonic hadn't been seen since they last battled Eggman. He had to explain. Sonic had overheard Eggman already talking about a new plan underway involving a Chaos Emerald he'd found. Sonic search high and low, everywhere Eggman had been. Then when Sonic heard Eggman's newest plan was haulted, he spied on him. He learned about Eggman's new plan involving NiGHTS and the Ideya. He decided to hit two birds with one stone, stealing both the Ideya and the Chaos Emerald right from under Eggman's nose. Deep within the Aquatic mine, the radar begins the beep for Knuckles and his team. It seems to point out a wall. Knuckles proceeds to punch the wall to smithereens then Omega clears away the debris. The Emerald was lodged deep within the wall. The trio attempted to slowly reach it when a large shadow fell over them. They turned around to discover that The Ghost King Boom Boo was haunting the place. "Here we go", Knuckles says. "Let's put this guy to rest for good, shall we?" Rouge says, readying herself. Omega continues to try and get the Chaos Emerald loose. "I will handle the Chaos Emerald. The two of you must occupy the ghost." Back at the workshop, Blaze awakens to find Shadow outside unconcious. She brings him in and tries to contact the others. What she does instead is something far different. She discovers a hidden threat. NiGHTS' and Reala's presence in this world seems to be distrupting it. They would have to soon return to their own or the two worlds would merge. Far away, deep within the jungle, Reala awakens. Enfuriated by the loss of the Emeralds, he stands. "What originally seemed only a minor threat to my plans seems to have become quite the nuisance. I'll have to be careful of these creatures in the future should they decide to interfere again. Make no mistake World of Reality, the realm of Dreams will soon be at your doorstep. My master shall rise once again", he says to himself. He looks up to the moon then flies off to proceed with his plans. The return of the world famous blue hedgehog can only serve as a small boost when compared with all that goes on around our heroes. Shadow has given the last of his energy to the powerful Chaos Blast attack, placing him in a time lock in which he is temporally frozen. Knuckles and his team soon find that they are overwhelmed by Reala's forces. They wind up deep within the Aquatic Mine and battling Knuckles' old "pal" the ghost King Boom Boo. Blaze has awaken to discover the truth. There is a threat within the threat. It's a power so great that Reala may not fully know the consequences of his actions. Knuckles and Slash run circles around the ghost king attempting to confuse it but he quickly catches on. The ghost disappears into the ground then shows up as a shadow on the ground. Knuckles and Slash both try to climb up a wall but the ghost leaps out and attacks them, making Slash drop his sword. "You know, for a dead guy, this one's pretty annoying", Slash complains. "That's what I said when I first had the pleasure of meeting him", Knuckles jokes. Rouge tries to take advantage of the situation and try and get the Chaos Emerald loose. Omega proceeded to drill but the wall around the Emerald wouldn't give. "Rouge, data analysis confirms that this wall is too dense to penetrate. Suggests seperate means of reaching the Emerald." Omega says, turning off his drills. "Dually noted. Tell you what, Omega. Let me borrow your Pseudo-Emerald", Rouge suggests. Omega opens his power hatch and Rouge removes the Pseudo-Emerald. She then hold it up to the Chaos Emerald within the wall and the two Emeralds release a bright light. The ghost king turns to see the bright light and fades away with an awful shriek. Slash jumps down and picks up his blade. The Emeralds suddenly begin to pulsate and the light completely consumes the room. The light dissipates and the team is suddenly floating over the city. But it isn't the same. This place is a twisted nightmarish place with strange creatures. Everything is completely ruined. "This isn't real", Knuckles said. "What happened here?" Slash asks. "Data analysis confirms...this unti does not have any idea. The Chaos Emerald seems to be emitting great amounts of energy. This is most likely an illusion." "This is no illusion. The Chaos Emerald is showing us the future!" Knuckles exclaims. The same light begins to pulsate once more and the team winds up in the city just nex the the hotel leading to the Emerald Coast. They look around then Rouge realizes Omega's still online. She opens his power supply hatch to find both the Pseudo-Emerald and the real Chaos Emerald inside. "Omega, I think that the Emerald brought us back here. But why would it..."
Within seconds, Sonic and the others burst through the doors of the hotel. "I knew it! I'd recognize that light anywhere!" Sonic exclaims. NiGHTS flies through the doors behind everyone and becomes overjoyed at the sight of the Emeralds inside of Omega. "This is wonderful! We're that much closer to defeating Reala once and for all." She says, spinning up high. "Not to mention that once we're through, Eggman won't be able to get his hands on the Chaos Emeralds or the Ideya. Now all we have to do is get the last Ideya." Knuckles says, crossing his arms. "No we don't. I have the last one right here." NiGHTS says, pointing to the red gem on her chest. "It is the Red Ideya of courage. Compliments of my former master." "In that case we can go after Reala right now since he has the rest of the Chaos Emeralds." Suddenly, Omega begins to broadcast a transmission from the workshop. An image of Blaze is projected before the group. "Everyone, we have a problem! Reala came by. He and Shadow must have fought. It looks like Shadow used up the energy he could in a Chaos Blast. His wrist rings were on the ground. He...he's in some kind of Temporal Lock", she says. "What?!" Sonic exclaims. "Okay what about the Chaos Emerald? Do you still have it?" "Unfortunately not. My guess, due to the blast radius, is that Reala didn't get it. In fact, it looks like Shadow used our Emerald plus the three Reala had in the blast. The blast itself must have caused the Emeralds to disperse", Blaze explains. "That's just great. So now we have to go find those four Emeralds all over again", NiGHTS complains. "It's better than the alternative", Knuckles says. "I take it Knuckles already knows. There is something terrible coming. We have to reverse whatever this is before it happens. Soon the entire world will be remade. It will completely merge with Nightopia." The conversation suddenly becomes painfully dark. A dead silence falls over the group. Sonic looks up at NiGHTS then at the rest of his friends. He runs up the stairs to the train station and turns around. "Alright everyone, listen up! We've got a big fight on our hands. This is bigger than anything Eggman could ever put together so we're going to need to be at our best. So here's the plan! Tail, Knuckles, and Amy are with me. We're going to go find those Chaos Emeralds. NiGHTS, you lay low for a while. Rouge and Omega are going to stay with you. Blaze, you, Addi, and this new guy can stay with Silver until he wakes up. Reala should be a bit less of a challenge without the Emeralds. You guys are going to take him on. Oh and Knuckles, I'll take the Chaos Emeralds." Knuckles reaches inside of Omega's storage until and hands Sonic the Emeralds from the Dry Lagoon and the Aquatic Mine. Sonic takes the Emeralds and grins. "Thanks, buddy, these'll come in handy!" "Excuse me", says a quiet voice from behind the group. Everyone turns to find a young echidna standing there. In her arms she held a Chao. "I would very much like to help. My name is Michella." "You're sure about that? Ah we can use all the help we can get. You can come with our group to find the Emeralds. Alright everyone, let's jet!" Sonic announces. "Tails, the Bi-Plane's great and all but if you ask me, it's time we brought out the big guns. It's Tornado time!" Tails nods and everyone but Sonic boards the train to the Valley. Sonic runs alongside the train and waves through the window halfway there then runs past the train at the speed of light. At the workshop, the teams split into their factions. Tails prepared the plane he'd been secretly working on, The Tornado 10. Tails hopped into the front. Knuckles, Amy, and Michella jumped in back and Sonic stood on top. "You ready up there, Sonic?" Tails asks. "Born ready, Tails! Let's do this!" Sonic gave a thumbs up to Blaze, NiGHTS, and the others then Tails pulled out with the plane and in seconds it took off going nearly the speed of sound. Blaze took out her earplugs after the sonic boom died down and gave everyone the signal. "Alright everyone. We have our assignments. We're to stay here. When Silver wakes up, he, Slash, Addi, and I will be on our way. Let's save the world." High up in the skies, Sonic is holding onto the new Tornado 10, grinning the whole time. Through the headgear, Tails speaks with him. "Sonic, the first Emerald is in the Ice Cap!" "Sweet! Let's show that mountain who's boss! Here we come!" The journey is far from over. With the heroes reunited after a long and difficult adventure, they find they they must now find the remaining Chaos Emeralds before Reala if they are to save their world and Nightopia from catastrophe. It's time for Sonic and the crew to show them the real power of teamwork. Hope they're fast enough. In the skies over the Ice Cap, the Tornado 10 seems to be coming in hot. Sonic jumps from the Tornado and lands on a rock below. Tails flips the plane and the girls all drop up. Sonic catches them all and puts them on the rocks. Knuckles jumps out and glides to the others as Tails flies off. Over the radio, Tails broadcasts an announcment. "Hey guys, I'll meet you at the station. I'm picking up signs of a Chaos Emerald back on the Emerald Coast!" "Alright, Tails, see you aroound!" Sonic says. "Let's get to that Chaos Emerald, guys", Knuckles suggested. Sonic looks around to find a way into the mountain when he sees a tunnel. He carefully hops the rocks to the top and runs into the side of the mountain. Knuckles looks at everyone then grins. He picks them up and tosses them to the mouth of the cave then glides his way there. Amy gets up and glares at Knuckles with one hand on her hammer but Michella puts her hand on Amy's shoulder and shakes her head. "He got us to the cave. Let's not fight right now. We could cause an avalanch." "Yeah, ok fine", Amy reluctantly agrees. Halfway through the cave, Sonic notices the forzen remains of an Eggman robot. Everyone passes by it but Knuckles who taps it. The ice cracks and the robot falls out. Knuckles realizes that nobody noticed and turns around to catch up with the others. As he runs around the corner, the robot's lights suddenly begin to glow and its parts begin to move. In the main cavern, Sonic sees the Chaos Emerald on a mound of snow. He runs down to pick it up when the cavern begins to shake. The Eggman robot suddenly emerges from the snow. The blades around its neck spin violently, kicking up snow. They suddenly spin faster, throwing the snow into a massive tornado of sub-zero temperatures. Sonic grins and turns to the others. He runs past them and out of the cavern, signaling them to follow. Amy and Michella both chase after him and Knuckles follows not far behind. The team makes it to the cave entrance just as the massive twister shoots the snow out. The result is a massive avalanche. Sonic looks around and sees a flat rock. He grabs Michella and Amy then jumps onto the rock and snaps it, creating a snowboard. He holds both girls in his arms while Knuckles glides down. The snow begins to catch up behind them. Far off on the Emerald Coast, Tails lands the Tornado 10 and immediately sees the Chaos Emerald. He hops out and picks it up to find that Reala is sitting on the nose of the plane. "Hello, fox boy. I believe you have something for me", he says. "No way, Reala! This Emerald doesn't belong to anybody!" "You foolish little pest. If you won't give me the Emerald then I'll take it." Reala flies directly at Tails but Tails manages to get out of th way and back into the Tornado 10. He powers it up and takes off with Reala right behind him. Reala was flying unbelievably fast. Tails then places the Chaos Emerald into the power slot and the Tornado 10 speeds up, disappearing in a blur. "Sonic, I have the Emerald! I'm on my way back to Ice Cap but Reala's after me. I lost him for now but I think he knows where I'm going! Sonic, Sonic can you hear me?" Tails panics. In the snow below on the Ice Cap, Sonic's head pops out from a mound of snow. He spins around, blowing all of the snow away. He searches himself for his walkie talkie then pulls it out of the snow. "I read you loud and clear, Tails. You come on over. We'll take care of him! Sonic out." Within seconds, Tails comes in low and everyone jumps in as it passes. Sonic stands on the back wing and as soon as he sees Reala, he jumps up and curls into a ball. Then he uses his signature homing attack on Reala, throwing him off. Sonic lands back in the Tornado and the team flies off. "Alright everyone, hang on! The next Emerald is in Casinopolis!" Tails shifts and the plane blasts off. At the workshop, Silver awakens and runs outside. Blaze is standing at the edge of the cliff, looking out at the ocean as Shadow had once done. "What's going on?" He asks. Blaze turns and looks over her shoulder. "Hello, Silver. It's really beautiful. I can see why Shadow was so entranced by its image." "Reala attacked us with some Chaos Attack then left. I woke up not long ago. The others are off searching for Chaos Emeralds. We have an assignment in the time being. We have to find Reala and stall him. A couple of others are coming with us. Go get ready. We'll leave shortly." "Do you think that we can actually do this? I don't want it to end like it did last time. I don't want to lose my friends again." Blaze puts her hand on Silver's shoulder and smiles. Then she walks away. The pleasant look vanishes from her face and is overcome by a look of grief and fear. A large shadow suddenly creeps over the valley as they leave. Storm clouds roll in and suddenly all looks horrifyingly grim. It begins to rain andSilver walks inside to get the others. The team walks out of the Workshop then Silver telekinetically lifts everyone. Using the new "Sight" that NiGHTS has temporarily given them, they will now be able to find Reala. NiGHTS looks up at the sky and soon realizes that the falling rain is black. It isn't just rain. It's water from the black sea of Nightopia. The worlds really were colliding. But the worst was yet to come. With two out of four remaining Chaos Emeralds found, the team is off to find the remaining two. Sonic and company are headed to the great Casinopolis where they expect to find the next one. Meanwhile, Blaze and her team are off to find the nightmarish fiend, Reala, before he finds the Chaos Emeralds. Blaze and her team soon arrive in the city. The new sense that NiGHTS has given them allows them to track Reala. They soon find that Reala's completely taken control of Twinkle Park. He's turned it from a park of wonder into a park of horror. The rides are cluttered with Nightmaren. Reala sits in the hall of mirrors meditating when he feels the presence of the others. He stands from his throne and approaches them through a portal. "Greetings young "heroes". What a suprise it is to come to my new domain. Of course you did provide the perfect location for it." He says, bowing and chuckling eerily. "Reala, why are you trying to merge the worlds?" Blaze interrogates. "I'm sure I have no idea what you're talking about. My plan holds no use of your world. All I need are your precious Chaos Emeralds. With them I can alter the very fabric of time." "Then you'll be all powerful. The merging of the worlds'll just be a side effect!" Silver shouts. "No, not at all you ignorant little oaf. Nonetheless, this time you happen to be intruding on me. It seems only fair that you be punished on this occasion. How about a tour of Nightmare?" Reala says. The doors to the park shut behind the group and seal themselves, locking everyone inside. Everyone tries their hardest to pry the doors open but they're soon surrounded by Nightmaren. Silver pushes them all down but more come up from the darkness. "This isn't going to be easy", Silver complains." "Nope...but it'll be fun", Slash snickers. He holds up his blade and starts running through the creatures. Not far away, Tails lands the plane outside of the famous attraction, Casinopolis. Everyone gets out and walks inside to find that it's much more massive inside than it looks. Sonic grins and crosses his arms. "I haven't been here in a while. Hey, they still have the old Sonic Pinball!" He says. "Sonic, we should search for the Emerald first. We can come back for fun when this is all over", Knuckles says. "Sure thing, Knuckles. Alright, split up everyone." Amy runs off to look around the second floor while Michella checks the bathrooms. Tails gets lost somewhere in the slot machines and Knuckles checks the basement. But Sonic soon finds the Emerald exactly where he expected it to be. It was in the vault, protected by a security field. Tails reaches Sonic through the communicator in the Emerald tracker. "Sonic, have you found th Emerald yet? No one else is having any luck." "Yeah, Tails, I found it. It's exactly where it always is. It's in the vault. Contact everyone and tell them to start having as much fun as they can. I'll see you at the vault later. The goal is 1000 rings. See you later." Sonic grins and runs into the Sonic Pinball machine. The number over the machine immediately begins to spike. In the basement, Knuckles sees a few old security robots. He stays hidden and jumps behind boxes until he runs out of cover. Knuckles jumps out and attacks the robots that turn and immediately begin to shoot. On the second floor, Amy sees the pirate show and decides to take a closer look. The fun for her doesn't last long. The robots on board suddenly go haywire. Amy crushes as many as she can with her hammer before being backed into a corner. "Why does this always happen to me?!" She complains. Tails begins to rack up coins by hitting all of the slot machines he can and draining them of rings. Then he picks up as many as he can carry and starts taking them to the vault. Michella wanders around and soon feels that something is in the bathroom with her. Her chao hides in her arms, apparently feeling it as well. "What is happening? It's like the world itself is going insane." Sonic, Tails, and Knuckles meet up at the Vault and drop in their coins. The total is 773 rings. They all look at each other, nod, and turn to get back to collecting rings but soon they hear two seperate screams. Sonic runs up to the second floor to help Amy while the other two go to help Michella. Back in Twinkle Park, Blaze and her team are riding Reala's demented rollercoaster. Slash stands on the front, chopping down any Nightmaren that get in their way. Blaze incinerated any that tried to respawn. The rollercoaster came to a horrific end when it jumped from the tracks. Silver held everyone up but when the smoke cleared it was Reala who emerged. "You will not give up, will you? I should have known that any friends of NiGHTS are as stubborn as she is." "You're right about that, Reala", Blaze says. "Fine then, I'll simply rid you of this apparent confidence. I do, after al, control this place for the time being." Reala summons more Nightmaren to overwhelm the team but Blaze and Addi create a flamethrower that incinerates everything in their way. Then they all make a break for it. The doors weren't far away but they were still sealed. Addi created a powerful gust to try and knock it down. Silver tried to rip it from teh hindges. Blaze even tried to blast it down. The door wouldn't budge. "It's no good, we're stuck in here!" "How very observant of you", Reala says. He catches up with them all then extends a hand, laughing sinisterly. In Casinopolis things aren't going very much more smoothely. Some strange things had appeared. They were like a combination of machine and Nightmaren. Sonic was busy defending Amy and Knuckles was handling Michella. Tails was all that was left. He dashed through Casinopolis, hitting ever slot machine he could. Then he picked them all up and ran them to the vault. Tossing them all in, he watched as the number rose. Sonic punched away one of these strange creatures them jumped up and kicked another. Running around in circles, he created a tornado to sweep them all away. "Sonic, my hero!" Amy rejoices, tackling Sonic. "Amy, wha, get off of me!" "Sonic!" Tails yells, running towards the pair with the Chaos Emerald in his hand. "I have the Emerald, let's get moving!" Knuckles comes out from the bathroom, holding Michella by the wrist. The entire group bolts from the Casino and jumps into the Tornado 10. Tails powers up the plane then takes off. "Where to next, Tails?" Knuckles asks. "The next Chaos Emerald is somewhere on the Red Mountain." "Well what are we waiting for, Tails? Let's go!" Sonic says with a grin. Tails powers up the Tornado and blasts off to Red Mountain. Below, in Twinkle Park, Reala grins darkly as he sits back down on his throne. "This plan is coming together. Soon this world as well as Nightopia will see the power of a god unleashing his true furry." Reala then disappears. In the plane, Tails notices a slight disturbance on the Emerald tracker. "What's the matter, Tails?" Michella asks. "Dream energy, there's some in the area. But...I don't see Reala or NiGHTS anywhere near us. There aren't any Nightmaren either." "Maybe it's just a glitch. You can check when we get to Red Mountain." Tails nods and continues to fly the Tornado 10, unaware that there is a dark presence just below them. It is Reala. He has latched onto the plane and smirks menacingly at the team who is completely unaware of his presence. He then disappears and rides along to Red Mountain with them. The team is now in possesion of six Chaos Emeralds. But it may not matter. Reala is hot on their trail after having beaten Blaze and her team. He's not giving up any time soon. His plans may actually be coming together very soon. We shall all soon see. Sonic and his team soon land on the Red Mountain. They all get out and begin to look around before the Emerald tracker goes off. Knuckles starts digging up the entire mountain with no luck while Sonic searches every corner. Reala hides behind the plane and snickers. "Guys, that dream interference is back", Tails says. Reala quickly disappears again and flies around the mountain to search for the Emerald on his own. Minutes later, Michella's chao starts scratching at teh ground. "I think we've got something over here!" Michella says. Knuckles digs into the mountain and pulls out a glowing gem but it isn't the Chaos Emerald. The gem suddenly begins to glow and the entire team is consumed by a bright light. They all awaken in the middle of the city. It's completely ruined. Everything around them has been completely reduced to rubble. Everyone looks around in total awe at this hope shattering sight. Amy and Michella become so overwhelmed that they fall into Sonic and Knuckles' arms, crying. "This is the fate that both your world and mine share", says a familiar voice. The team looks up to find NiGHTS chained up within a strange cage. She is injured and appears sickly. "You will fail to save the worlds in time. This is the end result. Our worlds will not simply overlap as they normally do when someone here dreams. They will physically collide." "NiGHTS, how did this happen?" Tails asks. "I...I can't tell you. It will only make things worse. Listen to me carefully. All of you must get the Chaos Emeralds before Reala. What he has planned will only blow up in his face. It will destroy him and everything else with it." NiGHTS suddenly begins to fade away into a bright light. Everyone watched as she let her head down and disappeared before them. They soon found themselves back on the Red Mountain facing the nightmarish fiend, Reala. He held in his hand, the Chaos Emerald. "It's funny what a Nightmare Gem can do, is it not? Welcome back from dream land." He says, chuckling darkly. "Reala, you give us back that Chaos Emerald!" Amy says, wielding her hammer. "You're in no condition to be making demands, my dear girl." "Reala, if you don't give us that Emerald, then so help me, I'll..."
"You'll what, Knuckles?" Reala questions with a sneere. Everyone grows quiet in disbelief. "H-how did you know my name?" Knuckles asks. Reala holds up the Chaos Emerald and before the group's very eyes, Blaze and her team appear. But there's something strange about them. All of their eyes are entirely black. They hold up their heads at Reala's command and approach Sonic's team. "The power of the Nightmare is most powerful at night. Especially when I've inflicted enough fear to keep people having bad dreams for weeks. Kill them." Blaze and Slash both gang up on Sonic while Silver and Addie team up against the others. Amy throws her hammer but Silver stops it in mid air and throws it back, throwing Amy down. Michella gets her chao to attack Silver when he's not looking but Addi creates a strong gust to blow it away and back into Michelle's arms. Knuckles and Tails tackles Addi and Silver but Blaze directs her attention to them and throws a fireball, getting them off. Reala soon notices the Tornado 10 not far off. He flies to it while everyone is distracted and reaches inside. Sonic leaps into the air and comes down in a solid kick to the back of Blaze's head, knocking her down. Then he grabs Slash's arms and throws him across the mountain top. Reala soon appears before him with all seven Chaos Emeralds. "What?! How did he get 'em?" Sonic exclaims. "Don't worry, Sonic. I'll save you and your friends for last. Right now I think I'll pay a visit to my 'sister'. Good day to you all." Reala says with a bow as he disappears into a bright light. "NO! Reala got away with the Chaos Emeralds." Sonic says. Blaze and her crew suddenly snap out of it. "What? What happened?" Addi questions. "No time to explain! We have to get to the workshop ASAP!" Sonic says. Everyone gets into the plane except for Sonic, Knuckles, and Silver, who all grab onto the outside. Tails powers it up and blasts off. Within minutes they arrive at the workshop to find Reala standing over NiGHTS' beaten body. She is struggling to get up when the team shows up. "Oh, well if it isn't the 'heroes'. Nice of you to stop by. You're just in time to watch me finish off this pest once and for all." Reala summons the Emeralds and they begin to orbit him. Sonic looks around and sees Rouge and Omega on the ground. Omega's pseudo-emerald. is on the ground next to the workshop, past Reala. He makes a run for it but Reala uses Chaos Control on him. He begins to laugh when he's suddenly struck in the back. Turning around, he sees none other than Shadow standing there with his arms crossed. "I think it'd be wise of you to surrended the Chaos Emeralds while you can." He says. Reala's focus leaves Sonic, freeing him up to reach the Pseudo-Emerald. "Take this, Chaos Control!" Sonic says. Reala suddenly freezes in time but it doesn't last. He quickly recovers and scoffs. "Fine. It seems that you and your pathetic friends will only submit to one whose power cannot be matched. In that case, please allow me to show you the fullest extent of the power of Nightmare." Reala summons the Emeralds once again and disappears in a flash of light. Dark clouds begin to roll in from all directions. "Sonic, this can't be good." Tails says. "Hey, wait a minute. NiGHTS is gone too! Reala must've taken her with him!" Knuckles exclaims. Without a word, Sonic runs off in the direction of the city. Shadow follows as everyone else gets into the plane. Amy and Michella look at Rouge and Omega lying on the ground. They agree to help them. Amy replaces Omega's Pseudo-Emerald and Michella helps Rouge up. Then they get on the train to the city. Deep within the city, Sonic and Shadow arrive, followed shortly after by Tails and the gang inside the Tornado 10. They see Reala floating high above the city. The Chaos Emeralds all surround him. "You won't submit to my power but perhaps you will submit to the power of a god!" He says. The Emeralds begin to rapidly orbit around him and glow. "Chaos Control!" The Emeralds all shine with an all consuming light and when that light finally decipates, the earth begins to shake. "Whoa, Tails, what is this?" Sonic asks. "I don't know, Sonic. But it's powerful!" Suddenly the streets above that portal in the sewer are swallowed up entirely. The portal has reached an enormous size to the point of almost being a crater. The Emeralds suddenly shoot a beam into the portal and from that portal rises a massive figure. It is truly awe inspiring. "My master", Reala begins. "Forgive me for the delay. I had to take care of a few minor pests." NiGHTS suddenly appears, bound in chains with a strange mask on her face. "Ah...NiGHTS. This one is the only being to ever claim victory over the power of a god. But as I have once attempted, I shall now erase this NiGHTS and restore her as a new, more loyal being. This is the will if the Wizeman." "To further your power, ny lord, I recommend these gems of power. They are called Chaos Emeralds. It should prove a simple task for you to take their power and add it to your own." "Indeed, Reala, it would be most useful in taking a new world." Wizeman suddenly takes the Chaos Emeralds and begins to drain the power directly from each and every one of them. NiGHTS awakens halfway through the process and realizes what has happened. "Oh no, Reala what have you done?" She break free of her chains and flies down to the others with Reala right behind her, having seen her escape. Reala rams into her and knocks her out of the air. "This is going to be difficult. Fighting Reala and Wizeman at the same time is...next to impossible. Sonic grins and gets ready. "Maybe you didn't get the memo yet, NiGHTS. We're the Sonic Team! Anything is possible for us!" NiGHTS sees the determination in Sonic's eyes and smiles. Then she and Sonic rush Wizeman. Shadow, Silver, and Blaze all attack Reala when his attetion is on NiGHTS. "Sonic, we have to get the Chaos Emeralds away from Wizeman!" "Hehe, no problem! Let's do this!" Now the time has come for everyone to finally give it their all. They must match the power of the Chaos Empowered Reala. Sonic and NiGHTS have gone to challenge the Wizeman, an entity so powerful that he's said to hold power equivilent to that of a god. How can they possibly meet the odds? Maybe this is one battle they cannot win. Stay tuned to find out. Reala attacks Sonic and NiGHTS but is quickly distracted by Shadow, Silver, and the others. He glares at them menacingly then holds his hand to the sky. Clouds violently swirl overhead and nightmaren creatures fall from them. Shadow and silver keep after him and leave the others to fend them off. Amy and Michella soon arrive with Rouge and Omega. They're just in time to stop the bloodbath that may soon have occured. Omega quickly begins to gun down any nightmaren in his way. Shadow leaps into the air and comes down hard on Reala's back with a powerful kick. Reala's thrown out of the air and slams into a building. 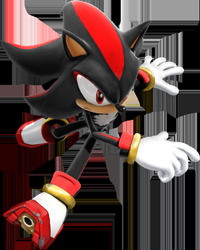 Picking himself up, he attacks Shadow but Silver stops him dead in the air. Shadow then bounces around like a pinball and strikes Reala repeatedly. But this barrage doesn't last. Reala somehow escapes from Silver's telekinetic powers and grabs hold of Shadow. Then he throws Shadow to the ground below. "Why do you even bother, Shadow? You know you cannot win. You're far too insignificant. You really believe you can match the power of a god?" He asks. Shadow gets to his feet and dusts himself off. Turning to Reala, he shoots a cold glare. "I may not be able to stand u to the power of a god. But you're no god. You can't stand up to me. I'm the Shadow, Shadow the Hedgehog. I am the Ultimate Life Form." He says calmly. Shadow then removes the power rings from his wrists and holds one in each hand. The ground around him begins to shake and small particles of debris start to float around him. "So you would challenge me in this state? You would use what little power you have at the moment to defeat me?" "You will never understand. When I entered stasis it was to replenish my power. Now I have more power than I ever have." Reala grins and attacks Shadow. Shadow looks at Silver and tells him to get back to the others while he takes care of things. Silver turns around and runs off, leaving Shadow to fight Reala alone. Looking over his shoulder, he sees Shadow grab Reala and throw him to the ground. Reala kicks him away before Shadow can get in a clean hit. Then the two clash, blowing up a massive dust cloud. Silver then continues back to the others. Omega and Blaze seem to be making good progress in clearing out the nightmaren. Tails and Knuckles fly by in the Tornado and drops a napalm on the field. Amy then hops in front of everyone and swings her hammer, creating a gust that blows the fire away from them. "Talk about Teamwork!" She says. Silver shows up and pushes down a wave of nightmaren that attempt to sneak up on the group. "How many of these things are there, anyway?" Silver asks. "I don't know. I think that as long as Reala's around, these'll just keep coming." Blaze says, jumping down from the debris and meeting with the others. "I left Shadow to fight Reala. He was doing pretty well from what I saw", Silver explains. More Nightmaren suddenly appear. Tails and Knuckles fly by again and Knuckles jumps out, landing in the middle of them all. He starts thrashing every nightmaren he sees and leaving none standing. Amy jumps in with her hammer and begins crushing the rest. Silver sees a large nightmaren in the background and grabs Blaze then runs off to face it down. Rouge and Omega follow, leaving Addi and Michella there. The pair both run off to see what progress Sonic and NiGHTS are making. They manage to climb up onto a rooftop and see Wizeman standing tall in the center of the city. Sonic and NiGHTS shot all up and down Wizeman but they couldn't reach the Chaos Emeralds without being knocked down. Every time they came close, Wizeman would employ a force fiend of some sort. "What is this?! I can't get close enough!" Sonic exclaims. "Wizeman's used this trick before. It's a barrier he uses to guard himself. It's all but unbreakable. But we'll need to distract him. I'll go for the Emeralds, you try to draw his attention." NiGHTS explains. She flies high above Wizeman while Sonic attempts to distract him. Wizeman looks down on Sonic and chuckles. One of his many hands then reaches down and grabs Sonic. Just when he begins to squeeze the life from him, NiGHTS appears. Flying as fast as Sonic can run, she snatches up as many Emeralds as she can. Wizeman realizes that the Emeralds are being stolen and quickly replaces the force field. "You think you can stop me with such a pathetic plan? I no longer recquire these Emeralds. They have served their purpose." Wizeman announces, expelling the Emeralds from his body. They all drop to the streets and rooftops of the city as Wizeman grabs NiGHTS. An Emerald lands behind Addi and Michella and they look at one another. Michella picks up the Emerald and nods at Addi. Then they run off to find the others. The group is just finishing off a wave of nightmaren when they arrive. "Everyone, listen up!" Addi says. "We got us a big problem! Sonic and NiGHTS just went down faster'n the ratings of last week's paper! We gotta do something!" "Wizeman tossed the Chaos Emeralds away. We recovered one of them. You should see what he's done to them. He's...he's drained the power from them completely. It's so sad to see." Michella says. "We should round up the Chaos Emeralds quickly. NiGHTS and Sonic are having a hard time." Slash runs off to search the city. Knuckles and Rouge take off together to look. Silver and Blaze pair off as well. Everyone else runs off to try and occupy Wizeman before being stopped by Shadow and Reala. Shadow seems to have the upper hand. But it doesn't last. Reala soon disappears in a flash. "Dang it, where'd that coward disappear to?" Shadow asks, putting the rings back around his wrists. "We have bigger fish to fry, Shadow. You have to help us out on this. NiGHTS and Sonic are trying to fight Wizeman and we gotta help 'em do it", Addi says. Shadow nods and runs off. The fight with Wizeman isn't going any easier. He immediately takes the upper hand. The area around him suddenly becomes strangely distorted. Shadow leaps along floating debris but it randomly evaporates. He falls to the ground below and quickly gets to his feet. "This isn't going to be easy", he says. He then notices the three Emeralds NiGHTS was able to retrieve, lying on the ground. Overhead, NiGHTS is flying around Wizeman, but she's no more menacing than a fly to him. He swats her out of the air like one and causes her to fall to the ground near the group. Then he claps two hands around Sonic when he's distracted and causes him to fall on top of NiGHTS. Everyone runs over to them to find that they're hardly alive. Amy drops to her knees next to Sonic and throws herself over him. "Sooonic! Sonic, don't give up on us, you hear me!" She yells, tears falling down her eyes. "Amy..." Michella says, shaking her head. Sonic's eyes open and he gets to his feet. But he's hardly able to move. NiGHTS soon follows. "There's...there's no way of stopping this." She says, struggling to get up. "Who says you guys are done", Slash says. Slash jumps down from a lamp post holding a Chaos Emerald in his hand. Rouge and Knuckles both run in and in Kunckles' hand is another Emerald. The last Emerald is brought in by Silver and Blaze. "I think you two need to show them just who the supreme power is!" Silver exclaims. "But the Emeralds are all completely drained of their power", Michella points out. Sonic grins and gives a thumbs up. "No problem! We've been through this before. Everyone remember's Chaos here. Let's do this!" He says with a smile. Everyone places the Emeralds around Sonic who closes his eyes. The Emeralds suddenly begin to glow once more and orbit Sonic. NiGHTS then makes a split second decision and jumps in, embracing the power of the Emeralds as well. Sonic's body lets off and bright light, changing color from blue to gold. NiGHTS goes through a similar change and the two look out over everyone and give a thunmbs up then look at each other and nod. They then fly off to face Wizeman. Upon reaching the all powerful entity, they stop to comfront him. "The two of you are a considerable nuisance. Do you not understand that I am all powerful? Do you believe that by simply employing the power of the Emeralds you can defeat the power of a god?" "Why not, Wizeguy? We beat Chaos, Metal Sonic, Devil Doom, and the BioLizard with the Emeralds. We can definately whoop you!" "I've beaten you even without the Emeralds, Wizeman. I'm not about to let you win again." NiGHTS declares. Wizeman then channels some immense power and fires it all at the two heroes. They stand up to the blast and embrace it. Then they deflect it and attack Wizeman with everything they have. "I'll show you just What I'm Made Of!" "Everyone will finally be free to Dream again! No more Nightmares!" It seems the tables have turned. NiGHTS and Sonic have now employed the power of all seven Chaos Emeralds. They now face the supreme threat that is The Wizeman. The two of them fly around the massive entity and hit him repetatively but he is far more powerful now with the energy he's drained from the Emeralds. Wizeman stands up to each assault with his newly enhanced force field. He then commands one of his six hands to grab and crush the pair. The hand disappears in a flash then comes back, wrapped around them. 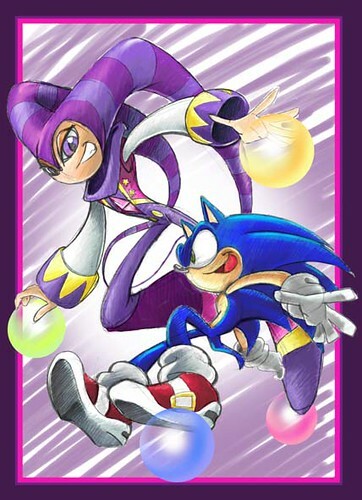 Sonic and NiGHTS both begin to struggle until they eventually break free. The blast seems to have damaged the hand. In fact, the hand then disintigrates into a bright light. "That...that's it, Sonic! Wizeman's hands, they store the power from the Emeralds. We'll have to destroy all of them", NiGHTS explains. Sonic nods and flies closer to Wizeman, dodging every blast he sees coming his way. Then he flies directly through the center of another of Wizeman's hands. Wizeman suddenly grows enraged and pulls out everything. His entire body begins to glow with this all consuming light. Then the light decipates and releases itself in a massive burst of power. Sonic and NiGHTS fly down ot the others and shield them from the blast. "This isn't working! Wizeman's way too powerful!" Sonic says. "Sonic is right. With the power of the Chaos Emerals, he's unstoppable. But here's where that changes. His hands hold the power of the Emeralds. We can destroy the hands and he'll lose power. But he won't fall for the same trick twice. We'll need a distraction." NiGHTS explains. Tails and Knuckles look at each other, grin, and jump into the Tornado. Omega, Blaze, and Silver follow. The team takes off in the Tornado with Sonic and NiGHTS right beside them. Wizeman channels more power then releases it in the form of a beam meant to destroy the Tornado. Sonic then blocks off the beam while NiGHTS gets closer. Tails flies over Wizeman and drops a few bombs but they explode upon impact with Wizeman's force field. While distracted, NiGHTS flies through the center of another of Wizeman's hands, destroying it. "You fools really believe that you can stop me so very easily?" He says. "Yeah, actually we do!" NiGHTS answers. Two of Wizeman's hands clap together around NiGHTS then release her. She seems to have lost her balance but she's okay. "You'll have to do better than that!" Sonic yells. Wizeman quickly begins to channel more power. Sonic recognizes this and grabs hold of the plane. "Sonic, we can't let Wizeman keep channeling power like this! It's weakening the planet! I can feel it!" Michella screams from the streets below. Sonic looks into the plane at Tails and the gang then turns around. "Hold on to something, guys." Wizeman lets out all of the power in another massive blast. NiGHTS quickly flies down to the streets and shields everyone who stayed down below. "This isn't going to work..." She says to herself. NiGHTS then flies straight up into the air. Wizeman grabs NiGHTS quickly with one hand and starts to crush her but Sonic pries the hand off of her. The eye of the hand unleashes a blast of energy that hits Sonic and sends him flying through buildings. "Note to self", Sonic begins. "Stay away from the eyes." NiGHTS gathers enough energy to blast the hand directly on the eye. "Sonic, we've got to try something else. He's only got two hands left but something tells me he's not going to put them out there again." "That's an easy one. Let's show them some Sonic Speed!" Sonic flies directly for one of Wizeman's remaining eyes at highspeed, so fast that he disappears from sight. NiGHTS follows, keeping up with him. The hands suddenly blast away but they can't land a hit and the pair fly through them. The hands disintegrate into the light and leave Wizeman wide open. "That's it! Wizeman's hands were maintaining his force field! Alright! Let's end this!" NiGHTS exclaims. She flies directly through Wizeman and comes out on the other end. The body of the all powerful Wizeman begins to release light from the inside. "What is the meaning of this?! How can this be?! I have the power of a god and more! How could you have defeated me with so little?!" Wizeman exclaims as he begins to fade away." "It's very easy Wizeman. Just as you created me, I have uncreated you." NiGHTS says with a smile. Wizeman's body then fades away revealing a much smaller creatures, a boy, similar to NiGHTS and Reala. He is dressed in black and white. The black gem on his chest then shatters. "I will be back! You cannot defeat a god!" Wizeman says as his body fades completely away. Everyone meets in the middle of the city to see what has just happened. The Wizeman was finally defeated. But this wasn't the end of the problem. The earth suddenly began to shake. The portal was beginning to expand. The world around everyone was beginning to fall apart and morph into something twisted. "This is the world merge! It's still hapening?! It was supposed to stop when we defeated Wizeman!" NiGHTS exclaims. "Is it ever that easy?" Sonic asks. "You two are going to need more power. But what can we use?! There isn't anything left!" Tails says, panicking. NiGHTS thinks for a moment then comes to an idea. She focuses on the gem on her chest which lights up. The red glow then releases four lights of other colors. They are Green, Blue, Yellow, and White. "You recognize these gems? They are the Ideya. We can use these. We must use them." She explains. Sonic looks at the gems as the orbit the two. The energies from each gem flow into the two and empower them. "Wizeman disrupted the balance of our worlds. We will now restore things to the way they once were. But Sonic...I must ask something of you. Please promise me that you will restore everything to the way it was before that portal ever appeared. I want no one to remember any of this terrible event." NiGHTS says. "Let's do this, NiGHTS!" Sonic exclaims with a grin. Sonic and NiGHTS fly up high over the city. With the powers of Chaos and Dreams they glow like suns. NiGHTS extends her hand to Sonic. "You must Dualize with me, Sonic. If this is going to work. Are you ready for a wild ride?" She asks. Sonic touches NiGHTS' hand and the two are consumed by a bright light. NiGHTS and Sonic then act as one. The Emeralds and Ideya all appear around them. Then the Ideya gem on NiGHTS' chest begins to glow. Light from every gem flows into the two then shoots down into the dimensional portal. The light begins to close the portal up while everyone below takes cover. NiGHTS then seperates herself from Sonic and absorbs the Ideya. Then she flies down to the others and gives a thumbs up. With one final bow, she disappears into the light. The portal then closed, leaving everyone in the streets. Sonic then flies down to them with all of the Chaos Emeralds. "Sonic, is it over? Is it finally over?" Blaze asks. Sonic nods and winks with a thumbs up. "It's all over...well not quite. There's one more think I have to do. This won't hurt a bit. Chaos Control!" The Emeralds then emmit a bright light that overpowers everything. When the light fades, the city is completely restored. Everyone is gone and everything is quiet. Not far away, Sonic is resting easy on the tree outside of the train station. "That was some adventure", he thinks to himself. "SONIC!" Screams a familiar voice. Sonic looks down from the tree to see Amy standing there. "Sonic, you get down here right now!" Amy grabs her hammer and hits the tree, causing Sonic to fall. "Amy, what are you doing?!" "Are you forgetting whose life I saved during Eggman's last charade?! Speaking of Eggman, he's been quiet lately...I wonder what he's up to." Amy looks back at her arms to find that Sonic is no longer in them. She sees Sonic trying to sneak away and immediately chases after him. "Sonic, you get back here!" High up in the sky is seems that there's not a cloud in the sky. But in fact there is one. The cloud is a dark storm cloud. It stands alone then fades away, revealing a nightmarish fiend floating there. It's none other than Reala. He looks down over the city and chuckles, thinking to himself "Another day, 'heroes'. Another day." Far below in the city, a manhole is uncovered. From within, a faint sound can be heard. It's almost like that of a flute. Then there is a familiar giggle. Um...That's all of the Ultimate Chaos Storyline. The Return to Nightopia storyline is somewhat unrelated. I don't mind if you post comments or whatever. I have the first chapter of the NiGHTS half but I don't want to start posting that side until I have at least up to Chapter 3.